Quiet and right in the centre of town! Several restaurants and the Regent Theatre within one minute walking distance. Enjoy FREE WiFi on all units during your stay. Once stayed at Kiwi Studios you will not want to stay anywhere else. 25 fully refurbished units. Flat-screen LCD TVs, king and single beds, Spa baths and family units available. Close to a wide range of cafes, bars and restaurants - fine dining, takeaways or casual cafe dining we have it all. Broadway Mall and Downtown Cinemas are just across the street from us. The Square, our city centre is just 3 minutes down Broadway. 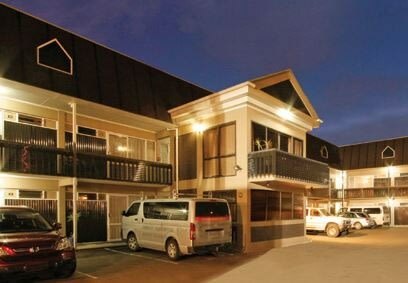 Choose Kiwi Studios Motel for central city accommodation. We are great value for money. Let the team take care of you during your next stay in Palmerston North. Late checkout available. Free & Safe off street car parking with security gates..
Quiet and right in the centre of town! Several restaurants and the Regent Theatre within one minute walking distance. Enjoy FREE WiFi on all units . . . More . . .